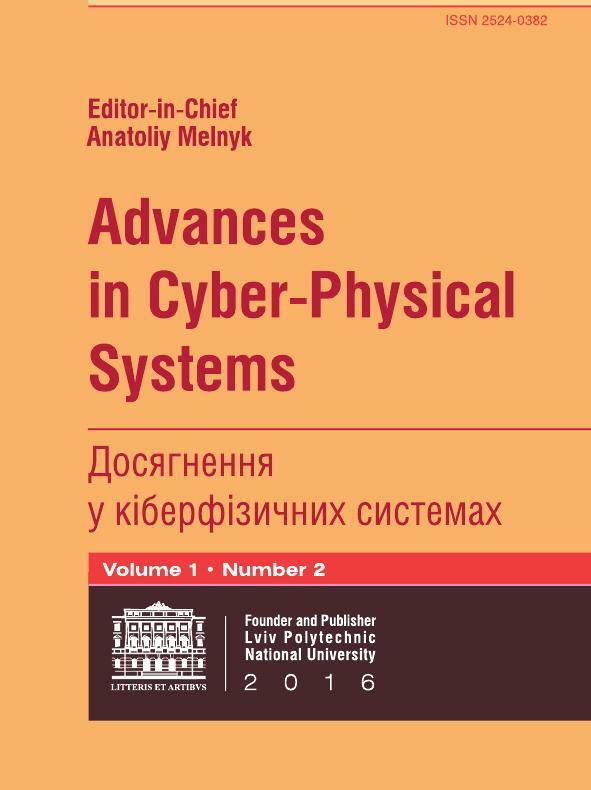 Advances in Cyber-Physical Systems is a peer-reviewed scientific journal, which aim and scope are to cover the subject areas in the fields of Cyber-Physical Systems. There is no page charge. The Editor-in-Chief evaluates manuscripts without regard to the authors' race, gender, sexual orientation, religious belief, ethnic origin, citizenship, or political philosophy. The decisions are based on the paper’s importance, originality and clarity, and the study’s validity and its relevance to the journal's scope. The Editorial policies of the journal are the Principles of Transparency and Best Practice in Scholarly Publishing to evaluate submitted materials, expecting authors to adhere to them. The Editor-in-Chief uses the journal’s standard electronic submission system for all journal communications. The Editor-in-Chief ensures that all submitted manuscripts being considered for publication undergo peer-review by at least two reviewers who are expert in the field. The Editor-in-Chief is responsible for deciding which of the manuscripts submitted to the journal will be published, based on the validation of the work in question, its importance to researchers and readers, the reviewers’ comments, and such legal requirements as are currently in force regarding libel, copyright infringement and plagiarism. The Editor-in-Chief may confer with reviewers in making this decision. The Editor-in-Chief protects the confidentiality of all material submitted to the journal and all communications with reviewers, unless otherwise agreed with the relevant authors and reviewers. In exceptional circumstances and in consultation with the publisher, the Editor-in-Chief may share limited information with other journals where deemed necessary to investigate suspected research misconduct. Unpublished materials disclosed in a submitted paper will not be used by the Editor-in-Chief or the members of the Editorial board for their own research purposes without the author's explicit written consent. Editor-in-Chief (in conjunction with the publisher and/or society) will take responsive measures when ethical concerns are raised with regard to a submitted manuscript or published paper. Every reported act of unethical publishing behavior will be looked into, even if it is discovered years after publication. If, on investigation, the ethical concern is well-founded, a correction, retraction, expression of concern or other note as may be relevant, will be published in the journal. The peer reviewers check a number of issues in the manuscript including assessing the validity of the research methodology and procedures. They would also be vigilant for any unethical practice in the research or plagiarism. If appropriate, they may recommend revisions and re-submission of an article. In other cases they may recommend rejection for various reasons. Reviewers should consult the Editor-in-Chief before agreeing to review a paper where they have potential conflicts of interest resulting from competitive, collaborative, or other relationships or connections with any of the authors, companies, or institutions connected to the papers. If a reviewer suggests that an author includes citations to the reviewer's (or their associates') work, this must be for genuine scientific reasons and not with the intention of increasing the reviewer's citation count or enhancing the visibility of their work (or that of their associates). The Editor-in-Chief of a journal is reliant on its reviewers to offer guidance on whether to accept or reject an article. Any manuscripts received for review must be treated as confidential documents. Reviewers must not share the review or information about the paper with anyone or contact the authors directly without permission from the Editor-in-Chief. Authors of manuscripts of original research should present an accurate account of the work performed as well as an objective discussion of its significance. A paper should contain sufficient details and references to permit others to replicate the work. Fraudulent of knowingly inaccurate statements constitute unethical behavior and are unacceptable. The Authors should ensure that they have written entirely original works, and if the Authors have issued the work and/or words of others, that this has been appropriately cited or quoted and permission has been obtained where necessary. The Author should not in general publish manuscripts describing essentially the same research in more than one journal of primary publication. Submitting the same manuscript to more than one journal concurrently constitutes unethical behavior and is unacceptable. Proper acknowledgment of the work of others must always be given. Authors should cite publications that have influenced the reported work and that give the work appropriate context within the large scholarly record. Information obtained privately, as in conversation, correspondence, or discussion with third parties, must not be used or reported without explicit, written permission from the source. Plagiarism takes many forms, from ‘passing off’ another’s paper as the Author’s own paper, to copying or paraphrasing substantial parts of another’s paper (without attribution), to claim results from research conducted by others. Plagiarism in all its forms constitutes unethical behavior and is unacceptable. When the Author discovers a significant error or inaccuracy in their own published work, it is the Author's obligation to promptly notify the journal editor or publisher and cooperate with the editor to retract or correct the paper if deemed necessary by the editor. If the editor or the publisher learn from a third party that a published work contains an error, it is the obligation of the Author to cooperate with the editor, including providing evidence to the editor where requested.